Nothing makes me feel my age more than listening to a news report about a story that happened in my own lifetime, one I clearly remember witnessing as it unfolded. A recent NPR report recounted the story of Sally Ride, the first American woman to fly in space – 31 years ago. Do you remember where you were when the space shuttle Challenger, carrying Ride and four other astronauts, took off on June 18, 1983? By the time the rocket booster separated from the shuttle, they had reached an altitude of more than 30 miles at a speed of more than 3500 mph. Ride, who died nearly two years ago this July, is an American icon. What an exciting time. I’m sure the many women and girls who watched her take flight out of this world and into what is still a relatively unknown place knew they were witnessing something truly special. 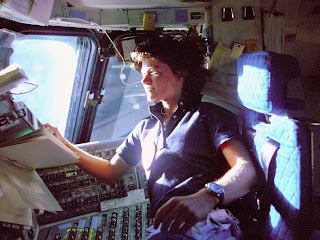 Sally Ride refused to be held back by the glass ceiling that has limited women’s aspirations because of their gender. Ride crashed through the glass ceiling that day, leaving behind her an opening for other women. I wonder if she knew the weight of this event as she left gravity behind that day. Never much of a space enthusiast, I still saw Ride’s historic flight as a milestone in our feminist landscape. Young girls now knew that they could set their sights on anything and gender wouldn’t hold them back. Lately here at Furia Rubel Communications, there has been much talk about women in the legal field. Even in 2014, 31 years after a woman first flew into space, it still can be difficult to wade through the waters of any profession that has been largely dominated by men. Our CEO, Gina Rubel, is writing a three-part series for AVVO Lawyernomics about the challenging path women have had to walk in the legal field. My partner became an auctioneer in 1984, a traditionally male-dominated field, and for a few years had struggled with the male mind-set within the industry as well as the bidders who didn’t want to buy from a woman. It has gotten easier over the years as she honed her craft, learned about the items up for bid and made friends who came to auction each week, but she still faces some backlash on occasion from those whose ways of thinking leave them many decades behind. Not many people I know have had the opportunity to work at a business that is wholly or mostly owned by women. Although women have owned businesses as far back as the mid-to-late 1700s and often they were businesses where being a woman was advantageous, it is only recently that it has been a true boon to the economy as this article from the National Women’s Business Council details. Furia Rubel was recently re-certified by the Women’s Business Enterprise Council for the eighth consecutive year as a woman-owned business. To qualify for this notable recognition, a business must, at the very minimum, be at least 51 percent owned by women. It is hard today to imagine that women in business and women-owned businesses were once a rarity. When reading the history of this topic, I feel fortunate to have been raised by parents who never discouraged any of my dreams when I was a little girl. Did you ever feel held back by your gender or did you feel you could fly like Sally Ride no matter what you chose to do? Do you have a woman from the past who inspired you by her moxie to be whatever you wanted to be? Where will technology take you this summer?